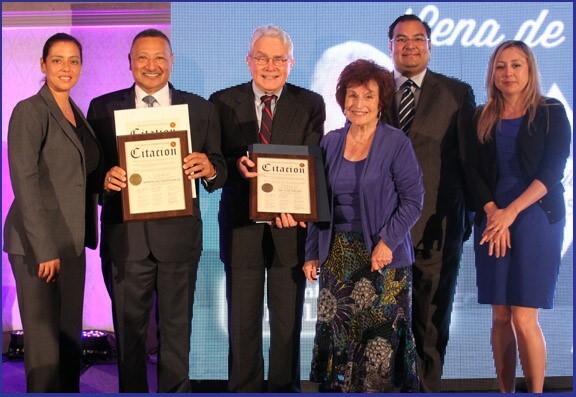 Presiding Officer Norma L. Gonsalves recently attended the Cena de Gala hosted by the Executive Committee of Long Island. The ceremony had the honor to have a main speaker Luis Palau. Palau is an Argentinian born international Christian Evangelist who has personally preached the Gospel to more than 30 million people all over the world since becoming a missionary. The organizers of the event along with the President of Long Island Hispanic Pastoral Association Apostol Salvador Garcia that runs a nonprofit organization with ministerial character that is put together by Christian pastors and churches on Long Island had an impressive attendance with a room filled to its capacity. The Dinner was a complete success. Cena de Gala was hosted by the Executive Committee of Long Island and presented by the President of (LIHPA) Apostol Salvador Garcia and it was held at The Upsky Long Island Hotel, Hauppauge NY on Tuesday June 23; the event was attended by a diverse audience, local officials and the press. Pictured: Suffolk County Legislator Monica Martinez, Apostle Salvador Garcia, International Christian Evangelist Dr. Luis Palau, Presiding Officer Norma Gonsalves , Assistant Deputy to County Executive Luis Montes, Community Relations Liaison Vanessa Diaz.